When it opened on the 30 May 1766 the Theatre didn’t have a Royal Licence. Under the 1737 Licensing Act, this meant it was technically illegal to host plays here. The Proprietors were wealthy, important people so the Theatre was unlikely to be challenged by the local authorities, but to be safe the managers had to advertise the first performance as a ‘Concert of Music and a Specimen of Rhetorick’ with a prologue and epilogue by David Garrick. 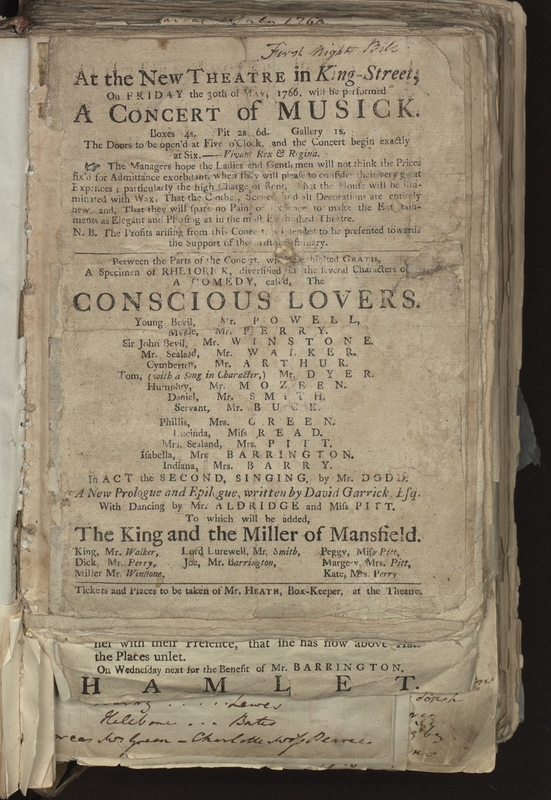 The playbill we have promotes Richard Steele’s The Conscious Lovers and the farce The King and the Miller of Mansfield. However, after printing the posters the Proprietors decided to lower the box prices. This entailed commissioning a new playbill showing new prices. We don’t have the second version, but the 1800 edition of Edward’s New Bristol Guide shows the afterpiece was also changed: the first farce at the Theatre was actually The Citizen.